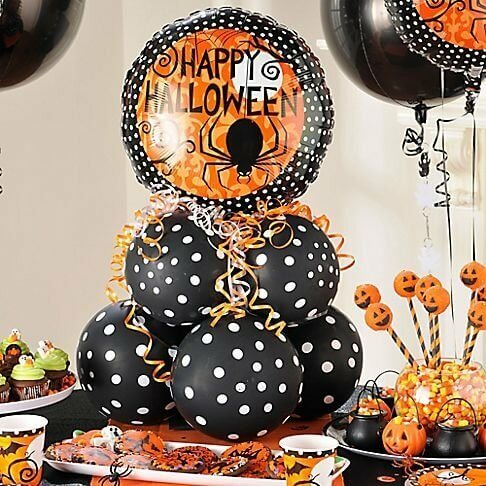 Try your hand on this fun and easy to make Halloween balloon decoration. You won't need helium. Read on for step-by-step instructions and a video tutorial. Watch the video and follow along with our written step-by-step instructions just below. Full credit for the video goes to Tanya from "Ask Me For a Balloon." Her YouTube channel is worth subscribing. 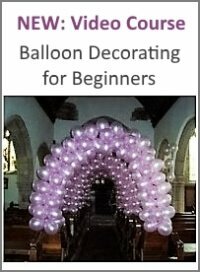 She publishes a lot of great balloon decoration tutorials. 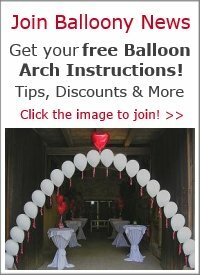 Inflate 4 of the 11 inch balloons to 8 inches. This equals about 20 pumps with a single action hand pump. 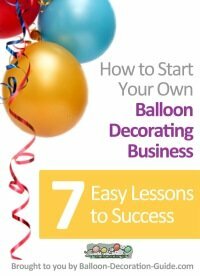 Best is if you use a balloon sizer to ensure that you blow up all balloons to the same size. Tie two balloons together, so that you get two douplets. Put one douplet on top of the other, and twist it over. The result is a so-called "quad" or quadruplet. 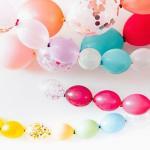 Take the balloon weight by its nozzle, place it in the center of the quadruplet and wrap it around your balloons. Inflate the next 4 of the 11 inch balloons to approximately 6 inches (equals about 10 pumps with your hand pump). Tie them together to form another quad. Now place the smaller quad on top of the larger one. Wrap one of the bigger balloons around one of the smaller balloons to attach the two quadruplets to each other. Cut 4 pieces of the curling ribbon. They don't have to be the exact same length. Hold the 4 pieces of curling ribbon in the middle. Wrap them round one of the upper balloons and tie a knot in the center of your two quadruplets. 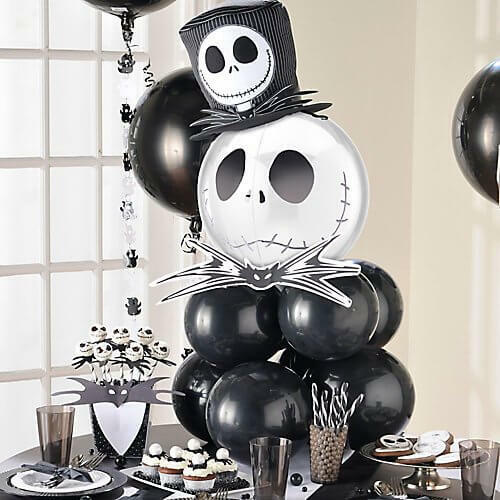 As topper for your Halloween balloon decoration you will need an air inflated 18 inch foil balloon. 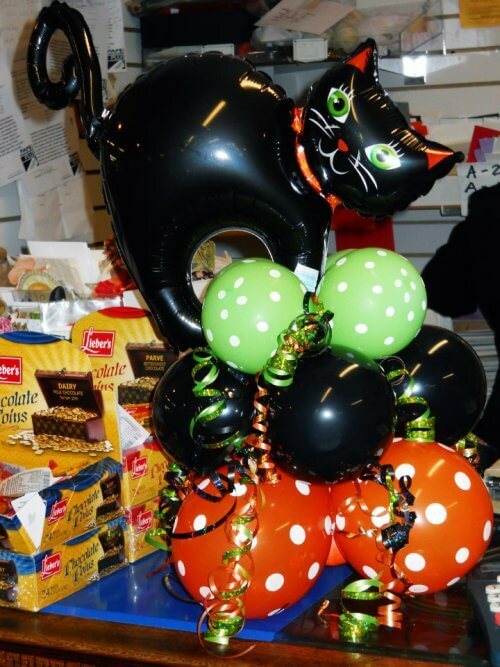 Instead of a round Halloween themed balloon, you could also choose a ghost, a cat, a bonehead or a bat shaped balloon. Whatever looks best to you! Attach the uninflated 260q balloon to the tab (= self-sealing valve) at the bottom of your foil balloon. If you don't have a 260q balloon, you can use a piece of curling ribbon. However, I find that a 260q balloon is easier to work with as it's elastic. Grab a hold of the two ends of the 260q balloon (or the string of curling ribbon) and place the mylar balloon at the top of the quadruplets. Wrap the 260q through the quads and tie the ends together at the bottom of the quadruplets. For the finishing touch, curl the ribbons, using the outside of your scissor blades. And voilá, your Halloween balloon decoration is ready to show off. That was easy, right? Here are two more variation ideas... what's it gonna be? Cute or spooky?